Nature`s Answer Liquid Co-Q10 is combined with Rice Bran Oil to improve absorption. Quik-Sorb is an exclusive blend of herbs known to enhance delivery of nutrients to the body. 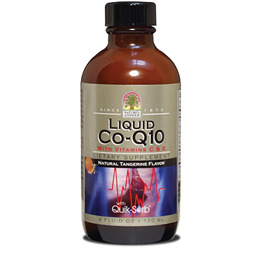 Co - Q10, an antioxidant, plays a key role in supporting heart health. It also acts as a "spark plug" for the cells, helping the body produce energy. Nature`s Answer High-quality natural products for vital healthy lifestyles since 1972. Other Ingredients: Purified Water, Vegetable Glycerin, Lecithin, Natural Tangerine Flavour, Xanthan Gum, Potassium Sorbate (0.2%), Vitamin E, QuikSorb (ginger rhizome, amla fruit, capsicum fruit). As a dietary supplement take one Teaspoon - 5 ml daily or as directed by your healthcare practitioner. May be mixed with water or food. Below are reviews of Nature`s Answer Liquid Co-Q10 - 120ml by bodykind customers. If you have tried this product we'd love to hear what you think so please leave a review.